Four people working in South Africa's Kruger National Park have been arrested in connection with rhino poaching, the country's national parks body has said. Sanparks said they included two field guides and a ranger - detained after two rhinos were found killed in Kruger, one of the world's largest game parks. South Africa has deployed hundreds of troops along its borders to help fight gangs smuggling rhino horns. 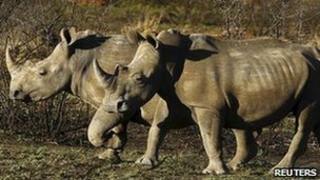 In 2011, a record 450 rhinos were killed by poachers, officials say. Large syndicates are often involved in the multi-billion dollar trade worldwide - exporting rhino horns from Africa to parts of Asia and the Middle East. The arrested Sanparks officials were stationed in a small section of the 2.2m hectare (8,494 sq miles) Kruger National Park. In this area alone, Sanparks says 11 rhino have been killed since the beginning of the year. "The animals had been shot and their horns removed. Further investigations into the killing of the two rhino and possibly other rhino poaching incidents in the area are currently being conducted," said Sanparks spokesperson Wanda Mkutshulwa. Sanparks spokesman William Mabasa told the AFP news agency that those arrested included a field ranger, two field guides and a traffic official. Another field ranger was at large, he said. According to Sanparks, 50 people have been arrested in connection with poaching since the start of the year. "I am personally saddened to discover that some of our own would so callously abuse the confidence and faith that we have entrusted upon them," Sanparks head David Mabunda said. The number of rhinos killed in South Africa has soared in recent years to meet the demand for their horns in Asian traditional medicine, especially in China and Vietnam, where they are thought to have powerful healing properties. But scientists say rhino horns are made from the same material as fingernails and have no proven medicinal properties. The black market price of rhino horn is now in the region of £35,000 ($55,000) per kg. South Africa has become the focal point of the rhino trade because it has between 70% and 80% of the global population - about 20,000 animals. The country's government has commissioned a study into whether legalising the trade in rhino horn could help reduce poaching.